Starring Keanu Reeves, Al Pacino, Charlize Theron, Jeffrey Jones, Judith Ivey, Delroy Lindo & Craig T. Nelson. Cameos: Alfonse D'Amato, Don King. 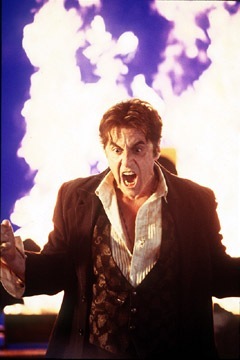 For anyone familiar with the Al Pacino school of overacting, the fact that Pacino makes a super Satan in "The Devil's Advocate" comes as no surprise. The fact that Keanu Reeves gives a powerhouse performance, as a talented defense attorney who comes under Pacino's thumb, may be a harder sell. But I swear it's true. This is the performance of Reeves' career -- a supernatural effort for someone who, until this picture, looked like a shoe-in for the lead if they ever make an Al Gore biopic. I can't resist the pun -- forgive me -- he must have made a deal with the devil. Reeves plays Kevin Lomax, a Florida defense lawyer with a perfect acquittal record. His knack for jury selection and closing arguments gets him noticed by a suspect New York law firm. The firm offers him an opportunity he can't pass up -- big money, big cases, power and nice Manhattan digs. With wife Charlize Theron ("2 days in the valley") in tow, he takes the job, ignoring many unnerving warning signs that something is amiss with his boss (Pacino), ironically named John Milton (ala "Paradise Lost"). Even after a precarious meeting literally on the edge of a sky scraper, clearly designed to test Kevin's mettle, he jumps in blindly to questionable cases for his new partnership. I realize on the surface this sounds like nothing more than "The Firm" meets "The Exorcist." In fact, I can't imagine why it hasn't been done before. But there's far more going on in "The Devil's Advocate" than elementary bone chilling and lawyer bashing. Themes of trust, fidelity and vanity are to be expected, but in this film they almost supplant the supernatural gimmickry. The story sticks closely to Kevin's relationship with his wife, who sees what he refuses to -- that there is something demonic about Milton and his associates. Theron is easy on the eyes to be sure, and it's hard to get past that at first and see what great work this actress can do. Her performance as the wife is uneasy, empathetic and visceral as she slowly goes mad while her husband, married to his work and consciously ignorant, neglects every opportunity to help her. Kevin is all wrapped up in a defending a triple-murderer, but he's talked himself into believing the guy is innocent. Meanwhile Milton is setting the stage for making Kevin a full partner -- which means a lot more than a corner office around this joint -- by killing off less obedient lawyers and taking a psychological wrecking ball to the wife's mind. Only in the last reel does "Advocate" roll out the heavy fire, brimstone and special effects. When it does, it's spectacular, and accompanied by a fired-up Pacino at his most menacing. Over the top is what the part called for. Pacino takes it a few steps beyond. He's incredible. Director Taylor Hackford ("Dolores Claiborne"), gives his film a lush, decadent visual style and a steadily seductive, dangerous atmosphere. He introduces deliberately shadowy characters so we don't know who to trust. He toys with our affection for Kevin by forcing forward his darker side. He even tries the audience's patience by allowing the story to drift into a transparently predictable, nearly insulting plot development toward the end -- only to completely redeem himself and even justify the use of such a lame twist. "The Devil's Advocate" is about 30 minutes too long, largely because Hackford was too vain to cut it. Many minor scenes take forever to get to their point, making major scenes we want to linger seem laborious, too. But Hackford displays such a conductor's control as he builds an unrelenting crescendo that you'll be willing to indulge him a little. How often does a film climax in a 15-minute scene of dialogue so provocative that the accompanying special effects can almost be ignored?